Uncomfortable moments between Willie and Benedict AND twin antics all in one page? You spoil us! Cilla is clearly smiling. TROUBLE! Thought you didn’t like the Benedict/Willie uncomfortable moments? And, yeah, the twins need more screen time. Thanks! It creeped me out in the sketching stage so I decided to keep it. Seems like an authentic face he would be making when no one’s looking. Indeed. It just makes him more loveable as a character lol. Dark and seething? LOL. 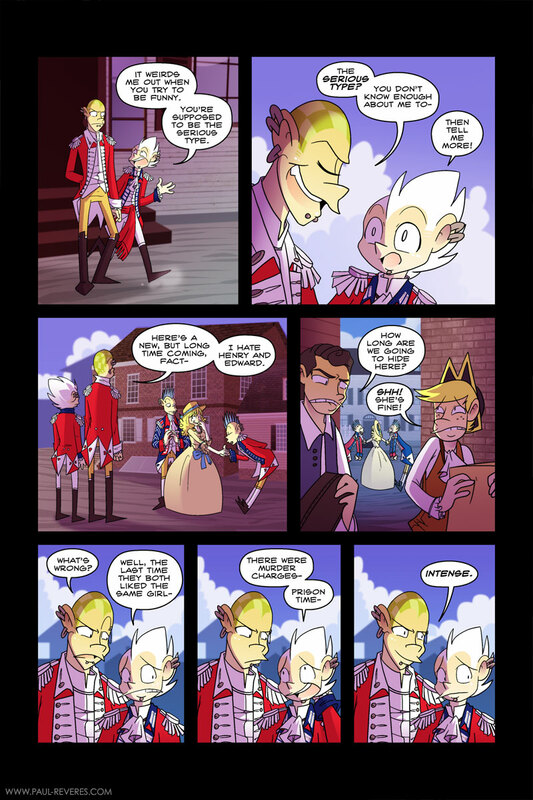 It’s all puppies and rainbows in The Paul Reveres. Heh, Willie is so delightfully weird. I love his dynamic with Benedict. Hehe. They’re a lot of fun to write together. I FINALLY CAUGHT UP! Tina, I awkwardly met you at the grande exeter Rev fest! Sadly, I’ll be away this year for it but whatever! And I LOVE this comic! I can totally relate to all female characters stuck in hose GODAWEFUL clothes! Haha, the women’s clothing is the hardest for me to draw. So complicated! I have incredible respect for people that can put up with wearing those clothes.